I hate CoC detailed rulings. I love making plays that do weird stuff and hate arguing for 20 min with the other player on whats supposed to happen. Is forced response to paying the cost before effect, as you pay cost before effect, or after effect, as its the slot for forced responses... hate this stuff, it's too complex and not thought out well in a systematic way. I think this simply means you can't turn, for instance, Altar of the Blessed (Core) 'off'. It doesn't mean that if I hit it with Burrowing Beneath (Core) the Altar still grants you a bonus. Are you citing the passage that states that "passive abilities are 'always on'" or something else in the FAQ? Sadly, I think Mummy doesn't brink back the stuff it shoots. Though it enters the discard pile before Necronomicon triggers, the FAQ states that only a disrupt could interrupt the execution of the action. I see your point - that the trigger for Mummy is a feature of the cost, not the action of Necronomicon, but I think your otherwise very awesome play would violate the timing structure as detailed in the FAQ. I certainly agree with you, though, that FFG rules/rule interactions often seem both post hoc and ad hoc. You are hardly the only person to feel that way! So that was a direct answer from Damon? Then I consider the whole matter dealt with. Crazy all-neutral deck is back on the drawing-board! Still would be nice if FFG could just rephrase problem cards like this and the Sorcerer/Sorceror + Cthonian/Chthonian drivel. The problem with passive effects and the ruling on Chess Prodigy is this: passive effects can be triggered at one time and resolved at another, even if the card that creates the passive effect goes away in the interim. You have to read the card correctly and establish both the initiation and resolution of the passive effects. Hopefully Azathoth was the only old and badly written card with this problem, but I am not all too hopeful. For me the issue with Chess Prodigy is that it's clearly a triggered effect which, were it properly worded on the card, would pose no strange counter-example to the normal interpretation of passive effects and their resolution. The only bad thing with this card is the overtly long flavor text, I would prefer it to just say "Tikeli-li!" Putting together two themed Mountains of Madness decks to duke it out in the Antarctic wastes has always been kind of a dream project for me. Miskatonic with sledge dogs vs Hastur and Elder Things (so Yog) would be the factions of course, maybe with a light Agency splash to get that crazy whaler into the MU deck. Now that the last two expansions has given us a lot of new polar cards maybe it's time to revisisit this theme. A year ago neither MU or Hastur/Yog had the cards to pull of a complete and functional deck. Now that has all changed with the last two expansions giving both sides some really flavorful, and not to mention powerful, effects witht the Polar keyword. Time to start brewing I think! I think there's a real opportunity for the Hastur box to bring them some more good characters and help distinguish them as more than a supporting faction. 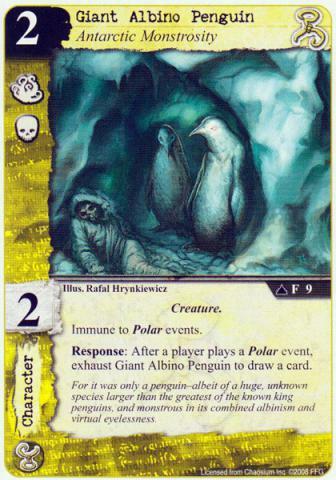 Hopefully there will also be at least some Polar cards in the set along with whatever else it brings. Some passive effects have a specific time that their effect will initiate, this should NOT be confused with them being triggered effects. Both Chess Prodigy and Azathoth are examples of this. Azathoth's passive effect will initiate at the end of the turn, not any earlier. Chess Prodigy's effect will initiate when he's committed (and lasts until the end of the phase since it doesn't specify how long the effect lasts). Somnambulant Dreamer (TWC) is another card of that kind. Very nice synergies withDreamlands Fanatic (ItDoN). I suppose the reason why Chess Prodigy's ability was not designed as a (Forced) Resonse is that they didn't want it to be possible to cancel it. Arguably a simpler way to achieve that would have been to add: 'This effect cannot be canceled. Don't get me wrong, this is an essentially semantic argument -- the rules are whatever FFG says they are. But I can understand the speed limit on the highway and still think it's dumb. Moreover, when the state cites its reasons for the speed limit, I'm not compelled to suddenly find that it was valid all along. Er'nrawr (SoK) initiates a passive effect at a specific time. Chess Prodigy, by any common sense interpretation, triggers. And of course the banned Agency card. There should be room for more cards like this though. Since it looks you pretty much into a two-faction deck you can increase the power level on the cards and support some really fun themes. Somnambulant Dreamer (TWC) is a great example of this, the The Cthonian Stone (TSS) is a less than stellar example. Hopefully FFG will make a boxed expansion full of cross-faction cards one day. There could even be the possibility of dual faction steadfast cards or some other mechanic for cross-faction splashing. What I like about Cthonian (or is it Chthonian?) Stone is that it's not the most obvious faction mix (though certainly MU and Shub are both very powerful factions right now). I'd like it if some more cards (not an excessive amount, though, since you want to be able to play the cards, after all) stressed 'unlikely alliances'. But, they're a good thing to have in the game overall to promote diversity and I think the only reason I feel like that is because there are so few of them that it feels like a special exception where I'm getting screwed by not being able to take that card. If it was more common, then I think you'd get used to it and not feel that way. It would become "normal". So, seems like the thing to do would be to take the next themed box and put out a bunch of cross-faction cards together. If they were to do that AND a new story deck, might need to cut out the Neutrals for that box to help make room. The downside is that the box would be mostly useful to players with big collections, as cross-faction cards are used less often than normal cards. So, the demand for the box might be lower among newer players? But, if they're "forced" to buy it due to having the currently legal story cards that part is fixed, other than player complaints. Some good thoughts in the above post, dboeren. I think the disadvantage of mandatory faction pairing should be offset by some cards that would be on the more powerful end of the spectrum or would be very powerful within a given deck strategy. Arguably Somnambulant Dreamer (TWC) does that, though I'm not even entirely sure about that. Lord knows people get bent out of shape about seeing the same few cards in every game, but I do see the point. CoC has a ton of really interesting cards to build around, but when you're building a deck to be 'competitive', you're going to automatically reach for certain cards within each faction, at least as a starting point. Case in point: I cannot imagine a good reason not to include Alternative Historian (SoK) in any MU deck. At all. Not doing so is simply obtuse: yes, I can eat the soup with a fork, but it just seems stupid in a world full of spoons. There are how many two-faction combinations possible in CoC? 28? You would have to make one card for each side meaning 56 different cards. Might be a bit much for a box after all. So some restriction of which ones to do would have to be made. Well, they wouldn't all have to come out at once, I don't think. Also, as some have already hinted, too much of it would be stifling, I think. But some really nice (that is, good enough to consider building around - which doesn't mean over-powered) agency or syndicate steadfast paired with some of the sexier factions would be a good start, I think. Also, lest I come off as somehow bitter, I think the game is really good right now, as evidenced by my being on this website all the time. But I still have thoughts on how it should move forward. I can only agree, the game is at a really good spot right now and it seems like FFG is actively working on the mechanics and themes that are currently underused/underpowered such as Day/Night and Polar.